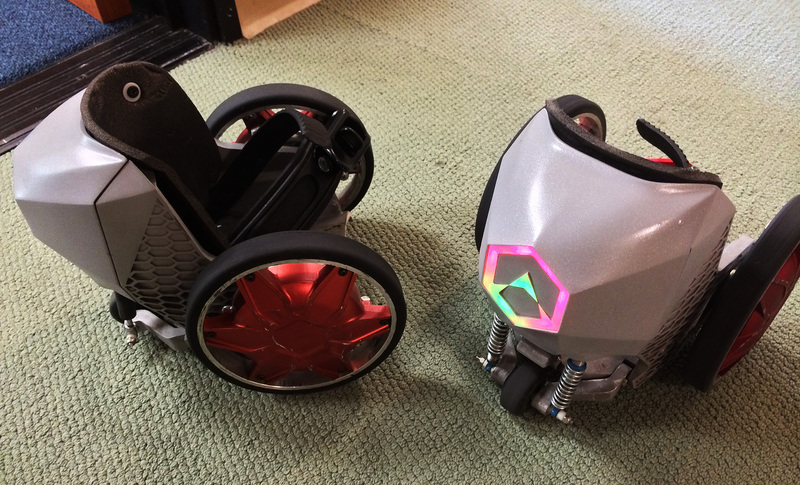 During my trip to Comic-Con 2014, I had the privilege of scheduling a meeting with Acton to try out their newest product – the RocketSkates. I initially discovered the RocketSkates on Kickstarter, where they currently have a campaign in progress. The goal was set at $50,000 and has already been surpassed by over 700%, now sitting at $351,000 with just under 600 backers. The closing date is set for August 22, 2014, so there’s still plenty of time to acquire a pair at a discounted rate. The RocketSkates were better than I had imagined. It’s one thing to see this kind of technology in movies, but everything changes when it’s right in front of you. These skates are moulded into two form fitted boots that go over your every day shoes. They attach with rollerblade-style straps and you’re ready to go. The RocketSkates feature no remote, so the control is done with your movement. Any type of board (surf, skate, or long) experience will assist in making the easy transition. It took me 2 runs down a hallway to get the motion right. The most beneficial skill that will adapt to these skates are from Heely’s. Your feet need to be in a straight line for balance and you lean for acceleration. The skates are not set for a specific orientation and will work whether you are left or right foot dominant. Your primary foot uses the lead skate to control movement. Once you are strapped in, tapping on the back of the skates will turn them on. A quick push from the rear foot will play a noticeable sound, letting you know that the motor has engaged. Acceleration is done by leaning the primary foot downwards. Once you reach a comfortable speed, you can straighten out your foot and glide along the path. Braking is just as simple and is done by pressing down on your heel. It’s very responsive and will engage immediately at a safe pace. Three models will be available at launch, each sporting a flashy cosmetic appearance and offering a different battery lifespan. The R6 features a 6 mile, 45 minute battery that will fully charge in 1.5 hours. The R8 has an 8 mile, 70 minute battery and can fully charge in 2 hours. The most advanced model is the R10, which can go for 10 miles or 90 minutes, and charges up in 2.5 hours. The RocketSkates charge via an included AC adapter that plugs into the back of the skate. Each model has a top speed of 12mph. They can also be used without the motor engaged for those who need to stop in a store or take other forms of public transportation. The skates can be left on and won’t hold back the user as they only weigh 7lbs. Acton also has an SDK planned for developers to make games and activities for the RocketSkates. A couple of games will be available at launch to showcase the possibilities, including Geo-location activities such as racing and capture the flag. A new feature called R-Control was also unveiled, allowing users to control the lead skate using a mobile device. This can assist in training for balance or help record video from different perspectives. Sadly, my time with the RocketSkates only lasted a short while. I really enjoyed the experience and look forward to the final release when they launch in October of 2014. I would like to thank Peter and Jen for arranging the meeting and I wish the whole team at Acton the best of success with this incredible product. To get more information on the RocketSkates or help fund the campaign and take advantage of a great deal as an early buyer, check out Acton’s Kickstarter.